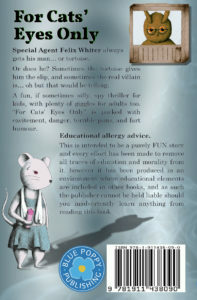 Written to coincide with the 2017 Summer Reading Challenge, “For Cats’ Eyes Only” is a fun, silly, action packed, spy thriller for young readers. Launched at the start of the challenge at Ilfracombe library, 300 copies were given to the children who signed up. 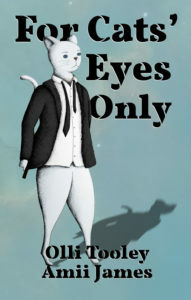 Want to read “For Cats’ Eyes Only”? You can borrow the book FREE from Devon libraries, and also Suffolk and Somerset libraries. If you live anywhere else, then please ask your local library to stock it. Alternatively, you can buy it in various formats. Audio-book – I STRONGLY recommend the audio-book from Bandcamp because you get so much for your money. Full audio version of the book, read by Morton Tooley. Full PDF of the book including B&W drawings, by Amii James, so you can read along on your tablet or laptop. Extra, colour versions of Amii’s drawings. Same price as the Kindle edition for an audio-book! If you can’t get it from Bandcamp, you can now also get it from Amazon, Audible and iTunes. The story of how the book came about. Early in 2017 Olli was approached by Ilfracombe Library, with a request that to write a children’s book around the theme of Animal Agents. He agreed, and local Ilfracombe philanthropist and benefactor David Tubby agreed to help with a generous financial donation. Olli had a number of ideas for the book but wanted to get the opinions of some young readers, so he wrote out a market research questionnaire, and sent a copy in to Ilfracombe Junior School with his ten year old Daughter Ellie-Rose. Ellie’s teacher, Mr Newell, had thirty copies printed off and did it as a class project. Using the children’s responses as a guide, Olli wrote the first draft in only a few days. “It just came in a great big rush and practically wrote itself.” He said. Then it went through a brief self-edit process, and was read out-loud to family members to get a general reaction. Everyone loved it including Ellie-Rose who is at the upper end of the target reading age. After a bit of redrafting it went out to beta-readers. One of the young readers noted that when Floppy the Rabbit spoke there were no ‘bunny ears’. It took me a few moments to work out he meant inverted commas. The book went off for a proper professional edit with Sarah Dawes, Olli’s preffered editor who is based in Bishop’s Tawton, North Devon. She is a brilliant, meticulous freelance editor, and Olli trusts her implicitly. All that remained was to find an illustrator. Olli put the word out online and got loads of responses back but for one reason or another nobody was quite right for the job. Olli was looking for a modern day E.H. Shepard on a tight budget. Remember this isn’t a big publishing house with a pile of money. Then a friend suggested getting in touch with the local secondary school, Ilfracombe Academy. The head of Art, Mr Lawton, couldn’t have been more helpful and he set up an opportunity for Olli to pitch to a group of enthusiastic students. Of those several then produced drawings to submit for consideration and one in particular stood out from the rest. The sequel “Dr Gnaw” is now out, and Olli is working on “You Only Live Nine Times” for publication in the summer.